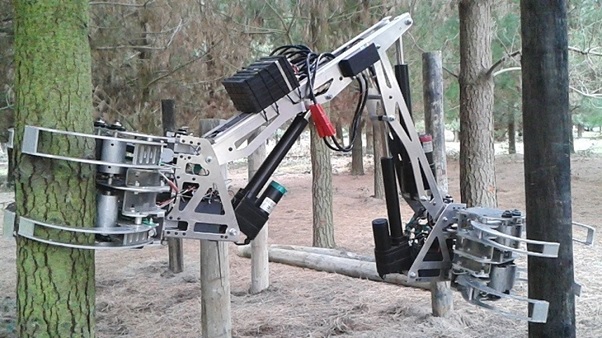 One output of the FFR Steep Land Harvesting programme, a robotic tree-to-tree machine, dubbed the “stick insect”, was demonstrated in September to a small group of forest industry representatives at Bottle Lake Forest Park near Christchurch. The concept of the Robotic Tree-to-Tree Felling Machine, where the machine uses standing trees as a means of locomotion, has been developed as an alternative to tracked feller bunchers to overcome the issues of operator safety, steep terrain, and soil damage by remaining above the ground, and being teleoperated, therefore overcoming the difficulties of ground surface travel. Through the Primary Growth Partnership with the Ministry for Primary Industries the concept of the “stick insect”, originally generated by Dr Richard Parker at Scion in 2002, has been developed to a proof of concept prototype. When the FFR Steep Land Harvesting programme started in in 2010 with the vision of “No worker on the slope, no hand on the chainsaw”, one of the programme goals was to develop alternative tree felling systems with the aim of eliminating manual chainsaw felling. Scion, in collaboration with University of Canterbury mechatronics programme final year engineering students and post graduates, developed the mobility system and the control system. A recent development has been the addition of an on-board battery power and a hand held remote controller to enable teleoperation of the machine. While this is an early prototype, the industry stakeholders who attended the field day agreed that the prototype model demonstrated the potential of the concept and that the original vision should be pursued with the aim of scaling up the tree felling system to a machine that is capable of felling small trees in a production thinning environment. Further development of the prototype is part of a wider automation and robotics technology proposal to be submitted to the Primary Growth Partnership in the New Year.